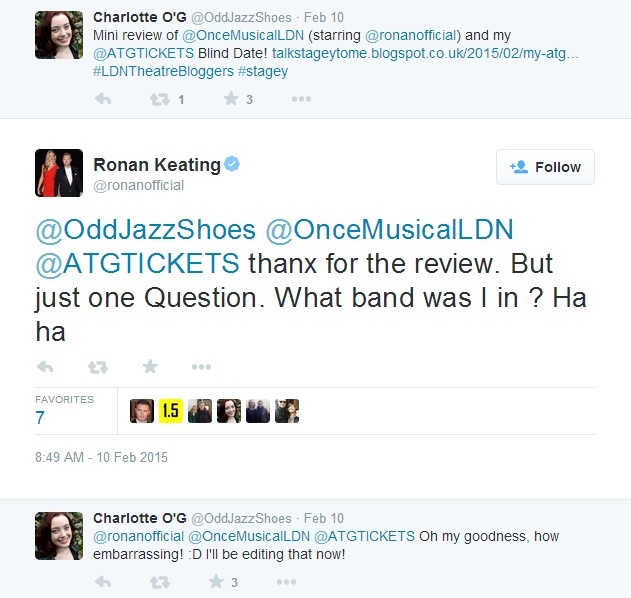 Last year Ronan Keating transitioned from pop star to West End star, when he took on the role of unlucky-in-love Guy in Olivier award-winning Once the Musical. He stands as the first Irishman to take on the role since Glen Hansard played the character in the original film. The singer-songwriter, who originally launched his musical career back in 1993 as a member of the band Boyzone, had never performed on a West End stage prior to his takeover in the role. Yet despite this, he has continued to prove himself to audiences, critics and fans as a worthy addition to the Once cast since he started fixing hoovers and strumming the rusty strings of Guy's guitar back in November. And we're not just talking about the armfuls of top ten singles and multiple platinum selling albums. Not only has Ronan dabbled in both presenting (Eurovision Song Contest, 1997) and judging (he's a resident judge on the X Factor, Australia) but, according to our good friend Wiki, he could easily have been representing Ireland in athletics just as effortlessly as he swoons us with his sweet music. The internet says that Ronan used to be a track and field athlete and at the age of 13 actually represented his country in several competitions. The talented teen even held the U13 200m title in the All Ireland games. Now that's impressive. Hello Mr Rear of the Year, 2003. That's right folks, somewhere on Mr Keating's mantelpiece a prestigious award giving full praise to his derrière truly exists. It's probably why he was all too comfortable in getting a little 'cheeky' during his screen-acting debut in 2013 film, Goddess. If you don't believe us, just see for yourselves (skip to 2:22, just sayin'..). Not only is he the singing voice behind Postman Pat in last year's Postman Pat: The Movie, let's not forget that we owe him ten-fold for giving us ALL the feels when he sings hit song When You Say Nothing At All as Hugh Grant and Julia Robert's characters get all mushy and romantic in 90s fav Notting Hill. As if you need a reminder..
We've all had that face palm moment where we just want the ground to open up and swallow us whole...like that time he headbutted the Pope! It's nice to know that us 'normal' folk are not alone..
As well as founding the Marie Keating Foundation and climbing the likes of Kilimanjaro for charity, he's also a great sport when it comes to viral charity campaigning on social media. No Matter What the cause, Ronan's your guy. You've got just 4 weeks left to see Ronan in Once the Musical at the Phoenix Theatre. Catch him quick before the curtain officially goes down and Tomorrow Never Comes for the show. Too much? We went there.